A corner of Mission Bay formerly home to golfers served as a different kind of driving range Thursday, as a new fleet of UCSF shuttle buses nimbly traversed an obstacle course, artfully weaving through orange cones and carefully backing into parking places on fresh pavement. The drivers were in training for what promises to be an electrifying change to the university’s extensive transit system, which shuttles students, faculty, employees and patients all around San Francisco. On Monday, the university and health care operation will roll out the first of 15 shiny new electric shuttle buses — a quarter of the school’s shuttle fleet. Over the next 10 years, the entire fleet of gas and diesel buses will be replaced with battery-electric models. The new 30-foot buses, made by Chinese automaker BYD, may be the largest private battery-operated transit fleet in San Francisco, according to Erick Villalobos, UCSF’s director of transportation services. The university is replacing 17 of its older shuttle buses with 15 of the new models, which look like compressed versions of city transit buses. The new buses have cushioned seats, wider aisles and room for 45 to 50 passengers, including standees, UCSF officials said. The new buses ride smoother and are as quiet as an electric car, except for the loud beep-beep-beep-beep when they’re backing up. 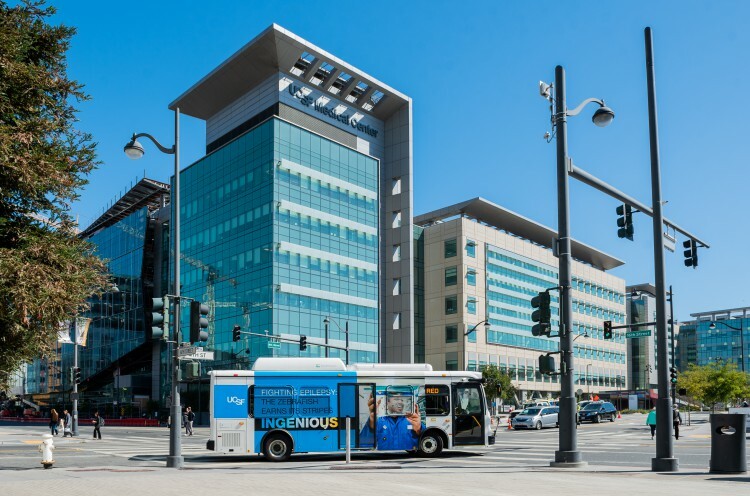 The UCSF shuttle system transports about 8,000 people a day on 16 routes that travel among university campuses, facilities and the 16th Street BART Station. The shuttles log about 1 million miles per year. UCSF decided to replace the 10 diesel and five gasoline-fueled shuttles with electric buses to help clear the air and reach a university goal of being carbon-neutral by 2025, Villalobos said. The battery-electric buses will remove an estimated 60 metric tons of carbon dioxide a year from the air. UCSF invested $8 million to go electric, an expenditure that includes not only the 15 buses at $450,000 for each, but also 15 charging stations and the construction of the new Mission Bay transit yard east of Interstate 280. One new bus will be rolled into service each week until all are in service around the end of the year. The first new bus will travel the red line, which runs between the 16th Street BART Station and the Mission Bay campus.